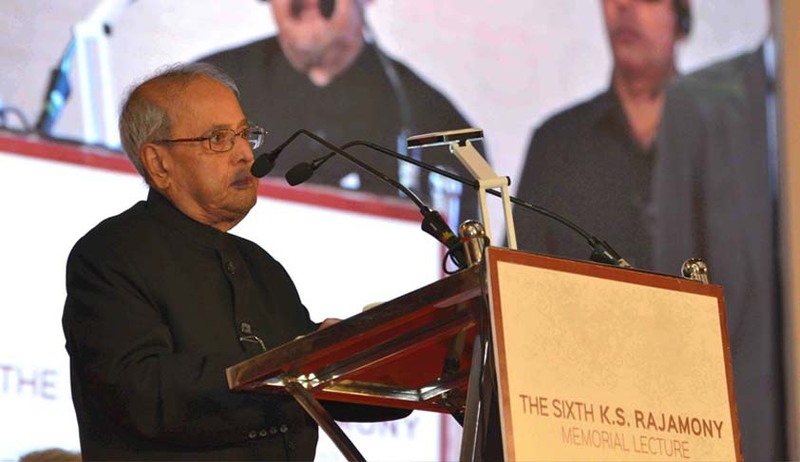 Harking back to India’s inspiring journey from 0 per cent growth rate to the world’s fastest growing economy over the past 70 years, President Pranab Mukherjee spoke at length on the vitals of our growing and democratic nation on a road fraught with challenges. Speaking on the occasion of 6th KS Rajamony Memorial Lecture, held in honour of eminent lawyer and former member of the Kerala Public Men Inquiry Commission KS Rajamony, President Pranab Mukherjee said, “The ultimate goal of any democracy is the empowerment of the individual, irrespective of his economic, religious or social standing. This may appear to be a utopian dream for many, but the strength of a system lies in its capacity to ceaselessly work for its accomplishment.” He pushed for continuous empowerment of the marginalised sections of our society and to create a political system accessible to all, irrespective of socio-economic status. He further asserted that “there should be no room in India for the ‘intolerant Indian’. Our society has always been characterised by the open contestation of diverse schools of thought and debate as well as discussion. Freedom of speech and expression is one of the most important fundamental rights guaranteed by our Constitution. There must be space for legitimate criticism and dissent”. Before deliberating on the issues facing India, he praised Kerala for its impressive records in the field of literacy, education, health, gender equality, tourism and culture. Touching various facets of our growing economy, the President encapsulated his thoughts under the head ‘India@70’. Dwelling into our glorious past with impressive growth rate, he said in the Past 70 years, tangible change could be seen in every aspect of our lives. He said India has transformed itself from a poor under-developed nation into the third largest economy in the world in PPP terms within a short span of seven decades. The President, however, expressed deep concern over the state of legislative business in the country. He said over the years, time devoted towards legislation has been gradually declining in Parliament. Illustrating his point with hard facts, he said the first Lok Sabha from had 677 sittings, in which 319 Bills were passed. In comparison, the 14th Lok Sabha from 2004 to 2009 had 332 sittings and passed just 247 Bills. The 15th Lok Sabha had 357 sittings and passed 181 Bills while the 16th Lok Sabha has had 197 sittings and passed only 111 Bills (upto the 10th session). He said behind the worrying scenario, were the interruptions and adjournments, which have led to humongous waste of time. He presented figures which accounted for the total percentage of time lost, out of which a shocking 41.6 per cent in the 15th Lok Sabha and about 16 per cent in the 16th Lok Sabha, time was lost to such disruptions. He stressed on the fact that the legislatures and parliaments are meant to represent people and not ‘arenas for combat’. He said, “Floor tests are not meant to be muscle tests.” He urged the parliamentarians to take their role as a moral obligation and duty and serve as models of exemplary conduct. Talking at length on the ideals enshrined in our Constitution, he urged the nation to be conscious of the fact that our democracy requires constant nurturing and no cost should we allow the exploitation of the fault lines. He said the Constitution is the most important legacy bequeathed to us by our founding fathers and dealt with the timeless values of democracy, social, economic, political justice enshrined therein, which under no circumstances, be compromised with. He further said the notion of good governance must be defined by the need of the times and enriched by the experience of the decades. Drawing from the ethos projected in the Preamble, he said achieving social justice and transforming rigid mindsets, requires contribution, not just from the legislature, but from every stakeholder, including the citizens. He said the ultimate goal of any democracy is the empowerment of the individual, irrespective of his economic, religious or social standing, marked with equitable distribution of wealth, eradicating poverty and building a strong foundation for a just, equitable and inclusive society. He said, economic development must be a ‘predominant’ aspect of state policy. “It is important to ensure that there is justice and equality of opportunity and the state does not create conditions in which the privileged few gain at the cost of the multitudes who suffer endemic poverty,” he said while stressing that the fruits of growth and development must percolate to the most marginalised sections. He further said it was equally important to consolidate the unity of the country in the ‘midst of extraordinary challenges and tremendous diversity’ unmatched by country in the world. Irrespective of the challenges, he said the nation is standing firm on the firm establishment of rule of law, independent judiciary, vibrant media, the civil society and strong institutions like Election Commission and the CAG. Stressing on the power and centrality of citizenry, the President said the leaders and political activists must cater to the public and be responsive to their needs. He said people must never be taken for granted and their trust they repose in their elected representatives should never be betrayed. “They must focus on the fundamental task of law making and raising of issues of concern to the people as well as finding solutions to their problems,” he said. Quoting from the speech made by Dr. B.R. Ambedkar to the Constituent Assembly on November 25, 1949, he drove home the point that working of the Constitution to a large extent depends on the people they choose to represent them and political parties as instruments of governance. Quoting Dr. Ambedkar, he stressed on the need to hold fast to constitutional methods of achieving social and economic objectives. Reflecting on the glorious yet arduous journey India has been through, he said when India became Independent, many in the world thought our democratic experiment would never succeed, considering the diversity, poverty as well as the lack of education. From a dismal 1-2 per cent growth in sixties, India has come a long way average of 8 per cent growth rate, he said. Commending ISRO’s record launching of 104 satellites at one go, he said India is a global player in IT, pharma, network, research and technology. He compared the current scenario with 1947, when we had no industry worth its name. Likewise, he said, a phenomenal rise in population has however been accompanied with rise in per capita income, increase in average life expectance, and increased foodgrain production. “India led a ship-to-mouth existence in the early days of Independence. We had to survive on import of foodgrain from abroad. Today, we not only produce enough foodgrain to feed ourselves, but are also exporting the same,” he said. Calling upon the need to ‘re-discover the sense of national purpose and patriotism’ that alone can lift our nation on to the road of sustained progress and prosperity, he urged the nation and people to strive hard to restore national pride.